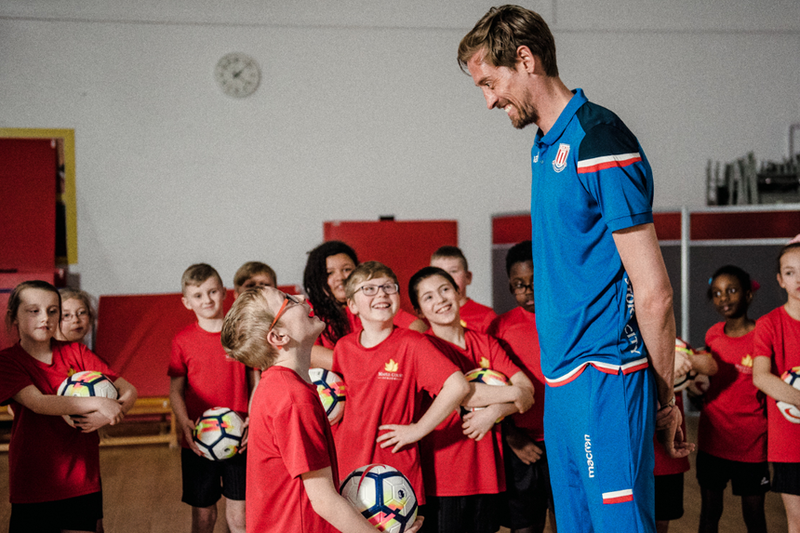 Peter Crouch hosted a PE lesson with a difference when he surprised children at Maple Court Academy to support Premier League Primary Stars. As part of the special "Best Lesson Ever" film, the Stoke City striker also revealed which team-mate is the smartest and why his captain, Ryan Shawcross, would make a good headteacher. Apart from the obvious - PE - it was English. I always quite liked English! What would your teacher say about you? My teachers would probably say I was a bit chatty, liked to laugh, didn't take things too seriously but worked hard. Which team-mate would be a good headteacher? Headteacher out of my team-mates would probably be Ryan Shawcross as he's the sort of guy that people usually like to do what he says. Which team-mate is the smartest? Lee Grant. He usually talks quite intelligently. Someone who makes me laugh every day is Charlie Adam. What advice would you give to primary school pupils? Listen to your teachers first and foremost, listen to your parents and try and have as much fun as you possibly can. Friend or Foe by Michael Morpurgo. It's about an evacuee in World War Two. What was your favourite school dinner treat? I love pasta, so I would say spag bol.